Dr. Andrew Wright is a British marine biologist that has been working on the science-policy boundary around the world for over a decade. His experiences have led him to champion a better communication of science to policy makers and the lay public. His research has included a population viability analysis for the vaquita, sperm whales bioacoustics and the impacts of noise on various marine mammals. Andrew is currently working on several projects, most relating to investigating either sleeping behaviour or chronic stress in wild cetaceans. He is also spearheading efforts to bring more marketing techniques into conservation outreach. Dr. Naomi Rose is the marine mammal scientist for the Animal Welfare Institute (AWI). She handles AWI campaigns to protect wild and captive marine mammals and is a member of the International Whaling Commission’s Scientific Committee. She has published popular and scientific articles, authored book chapters, and lectures annually at several universities. She participates in workshops and task forces at the international, national and state level. What you are looking at is not a prop from a science fiction movie, but a very earthly (or more accurately marine) wildlife organ that is causing Mexico quite a bit of trouble. It’s the swim bladder of the totoaba fish. Unrelated to bladders with which people are more familiar, it is a collagen-rich organ that the fish fills with air in order to remain buoyant in the water column and save energy when swimming. It is, quite literally, a bag of hot air. This one is dried and ready for shipping – it is prized as a delicacy in China, where it is believed to rejuvenate skin and (of course) act as an aphrodisiac. The totoaba itself is the largest member of the drum family and can grow to two metres in length and weigh in at 100 kg. It lives in the Gulf of California, between Baja and mainland Mexico, and can live for 15 or so years. Unfortunately, it is slow to mature, reaching sexual maturity at around six or seven years of age. It also spawns only once per year. It is no surprise then that historically intensive (and over-) fishing has led the IUCN to list it as critically endangered. Like rhinos poached for their horn or elephants for their ivory, totoaba are fished only for their swim bladders. The rest of the fish is wasted. The bladders are sought not only in China, but also in Chinese communities up and down the west coast of the U.S. Killing this endangered species is illegal in Mexico and the trade in its parts is illegal internationally. Unfortunately, like rhino horn and elephant ivory, the trade in totoaba bladders is lucrative, with two swim bladders raising enough money for the average Mexican fisherman to buy a new truck. There is, thus, a good deal of incentive to continue fishing for it, despite the threat of legal consequences. Similarities with the poaching of rhinos and elephants start to vanish at this point. Firstly, this trade is hard to track all the way from source to consumption. Poachers are easily hidden among legal fishermen on the water and the majority of the evidence (e.g., the rest of the carcass) is conveniently hidden at the bottom of the Gulf. Next, the bladders are nowhere near as big or heavy as elephant tusks, so they are easier to smuggle. Finally, aiding the success of smugglers, enforcement agents are not able to readily identify the swim bladders as contraband, given that other similar swim bladders may be legal. Of course, this also requires them to be able to identify the object at hand in the first place, the difficulties of which we touched on above. All of this explains why there have only been a handful of busts as the swim bladders cross the border into the US. 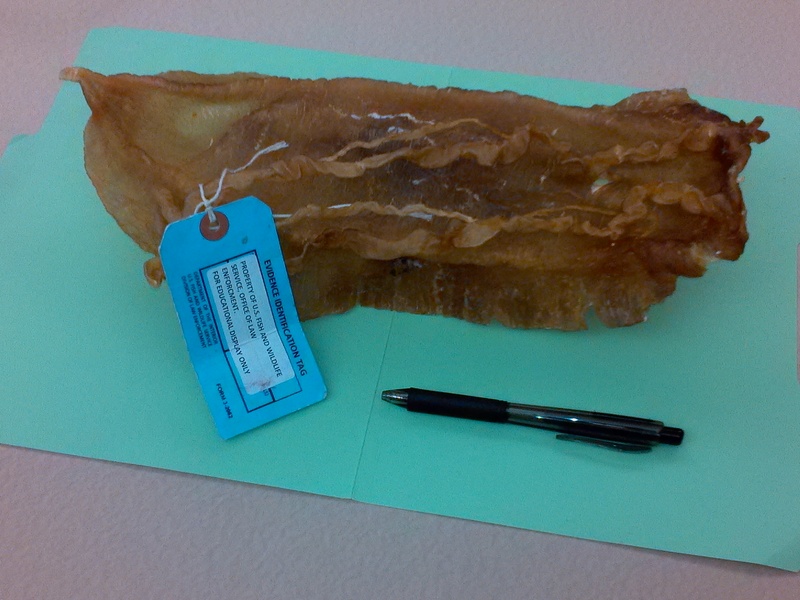 However, there is one other aspect that sets the trade in totoaba swim bladders apart from other illegal trade in wildlife products; it’s what is really causing Mexico headaches. This trade is pushing two species toward extinction, not just one. The vaquita is a porpoise, the world’s smallest cetacean, and is found only in the northern Gulf of California. The vaquita is actually smaller than the totoaba, reaching only 1.4 metres in length and weighing just over 50 kg. Vaquita are accidentally caught and drowned in nets set for both shrimp and totoaba. While the shrimp nets are bad, if a net were to be designed specifically for catching vaquita, they would look very similar to the nets set for totoaba. The vaquita breeds even more slowly than totoaba and is set to become only the second cetacean species driven to extinction by human action (the first was the baiji or Yangtze river dolphin). Experts, who estimate there are fewer than 100 vaquita alive today, believe this will occur by 2018 if the current rate of population decrease continues. Following many years declining in obscurity, the imminent extinction of the vaquita is beginning to draw considerable domestic and international attention to illegal fishing in the Gulf. Indeed, the loss of the vaquita would at this point be a public relations disaster for Mexico. 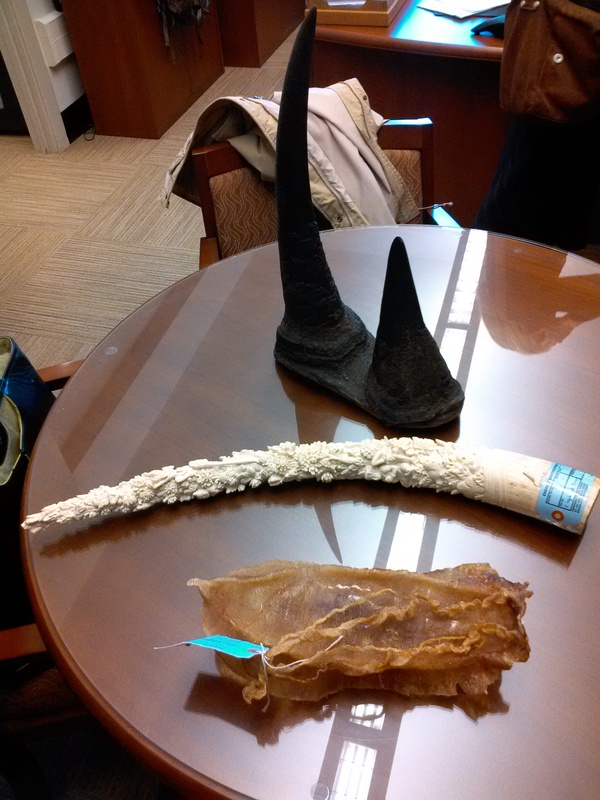 So, here we have an illegally-traded wildlife product that is not widely recognized, not easy to distinguish from similar legal items, leaves little-to-no physical evidence at the site of collection and is driving two species extinct. Please spare a thought, next time you hear of rhino or elephant poaching, for the totoaba, the vaquita and all the other species threatened by lesser-known or well hidden illegal wildlife trades. And spread the word and this image – or it will soon be too late for this pair of Mexican treasures. “…the imminent extinction of the vaquita is beginning to draw considerable domestic and international attention to illegal fishing in the Gulf” — Sadly, I believe it is still not enough attention. Media have picked up on it, but coverage still does not remotely compare to more popular contemporary issues like the perceived animal welfare issues connected to killer whales in captivity. It would really be a disaster, not just for Mexico, if we lost the second cetacean to extinction within just a decade. #SaveTheVaquita — and good luck, desert porpoise!